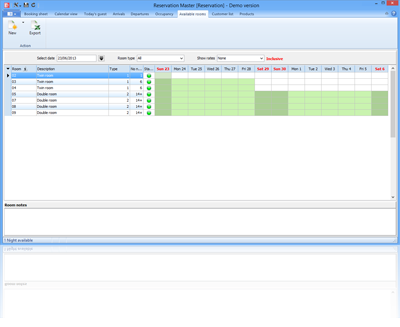 Reservation Master is a reservations software package developed for use in Hotels, Motels, Guest Houses, Bed and breakfast, Lodges & Inns and Campgrounds worldwide. It offers an easy to use, economically priced, yet robust solution for reservations, front desk, unlimited history, easy reporting. – Product buttons for you invoice. – Generate invoice number as required. – Main room and sub rooms. – Use of colour schemes. 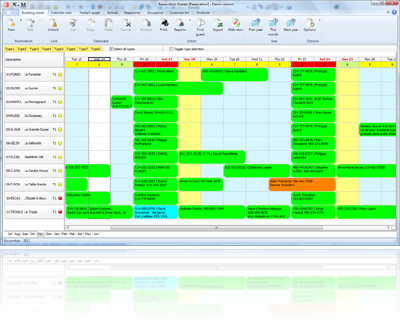 The main booking sheet display reservation color coded based on it guarantee status, right click the mouse button and a pop up menu will be displayed from here you edit reservation etc. Right click on an empty room will give you the option to make a new reservation. The booking sheet is based upon a pencil and paper booking sheet most people are familiar with. Using the layout view you can use your own layout to provide you with an instant view of which rooms or in case of a campground which site are vacant or occupied you can even edit reservation and generate invoice from this screen. You can now click on a site and guest information will be displayed. The product screen displays the list of product you have available, this allows you to sell and add products to your customer invoice. – English, The base language of this program. Help files are in English. – Español, Português, Nederlandse, Français, selectable from the language menu. – Additional language files are available for download. The user can easily translate the interface of this program into any other language if so required. Nothing is more attractive to a potential customer than a knowing exactly what they are paying for. – Yes, Email support is provided free of charge. – Yes, except for web reservation you do not have to pay an annual subscription fee. 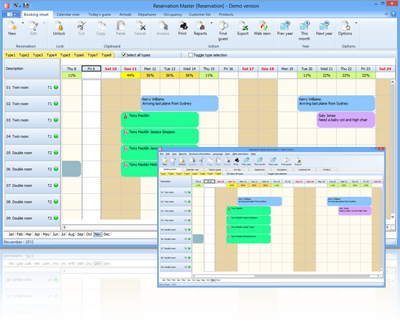 Reservation Master is a reservations software package developed for use in Hotels, Motels, Guest Houses, Bed and breakfast, Lodges & Inns and Campgrounds worldwide. 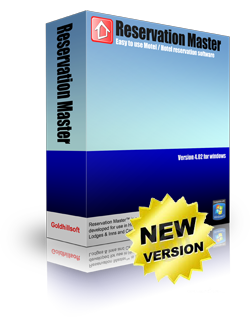 Reservation Master version 8.01 and Reservation Master Pro version 8.01 (Windows 10 support) is now available Click here for version comparison. This version also includes the support of Window 7 and Windows 10, a continuous booking calendar and many other improvements. Have you had days where you had to decline a reservation, because you were already holding a reservation for an expected guest, only to realize later that the expected guest was a “no show” and after further investigation, you discovered that the reservation was not guaranteed? That’s why we created this software. You’re presented with a color-coded booking sheet which provides you with instant information on your room availability and the guarantee status, reducing the possibility for mistakes. This software is easy to use. We are of the opinion that if you can’t understand a piece of software in five minutes, it’s too complicated to ever be of proper use. With this in mind we developed Reservation Master to be so easy to use you’ll have it up and running in less than ten minutes. The booking sheet is based upon a pencil and paper booking sheet most people are familiar with. You can select from the five build in languages or download and install additional language files if so required. Alternatively create your own translation by editing the language file. – English, The base language of this program. The program help file is written in English. – Español, Português, Nederlandse, Français are build in. Please note that additional language are translated using automated translation engine and may not be 100% accurate. Export raw data when required. An easy-to-use interface is provided for exporting selected data, which you can then use in other programs of your choice. 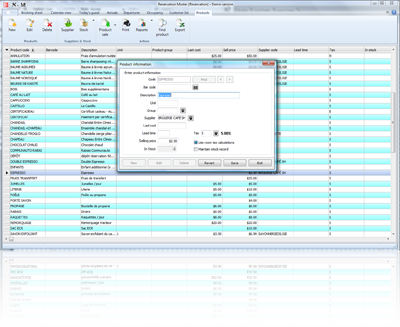 In many cases just click the Excel button to export the selected sheet to Excel. This software will generate these reports for you so you have providing you with accurate information on your income and occupancy. Beside this occupancy levels are displayed on top of the booking sheets at all times. Create an occupancy web page. From the calendar tab you can create a web page displaying you occupancy status, which you can customize and upload to your web site. Click here to display a sample web page. In addition you can generated reports which provide you with an up to date room availabilty information. Version 8.01 of Reservation Master also support the option to interface with Staah Channel manager www.staah.com STAAH Channel Manager connects to the major third party global websites such as Booking.com, Expedia, and Wotif.com, via ONE access point. This eliminates manual, time consuming manipulation and management of each site. In order for this function to work you will have to register with Staah and agree with their terms and conditions. Please note that this option has to be installed separately and is not part of the demo and is a complementary option. Click here to download the interface manual. Version 7.01 of Reservation Master support the option to interface with Site Minder www.siteminder.com which provide you with the option to access with the worlds leading online bookings sites such as Expedia, Booking.com, HRS, Hotelbeds, Orbitz, Agoda and many more. In order for this function to work you will have to register with Site Minder and agree with their terms and conditions. Please note that this option has to be installed separately and is not part of the demo and is a complementary option. COMING SOON, Version 8.01 of Reservation Master also support the option to interface with YieldPlanet Channel manager www.yieldplanet.com. Please note that this option has to be installed separately and is not part of the demo and is a complementary option. Display a layout and indicate what is occupied. 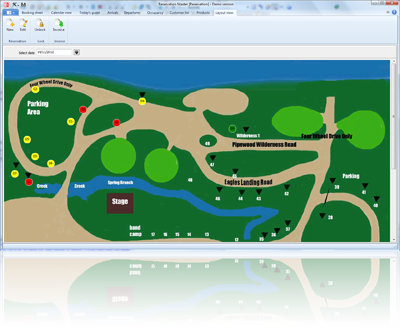 You can create your own layout of your establishment and indicate which units are occupied. This feature is especially handy in case you are managing campground as it tell you what is available. I am only operating a small Motel / Hotel. The booking sheet does the job just fine. Maybe, but have you considered that with this software, you can print out your booking sheet, or if you have a laptop computer, you can even take the front office with you while inspecting a unit or working on site. After all, most operators can answer telephone calls remotely, however, in order to take a telephone booking, ordinarily you would need to go back to the office while keeping the caller on hold. You most likely will be a Motel / Hotel operator, although this software has been used by other organizations, including a cattery. 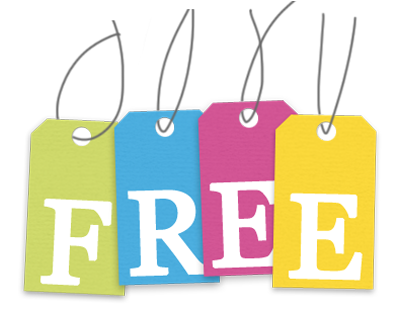 You are free to download the 30-Day trial to see for yourself. There are no other restrictions to the program. If after the trial period, you decide that this program is indeed for you, it can be purchased online. Your entered data is saved upon re-installation. “Upgrade price for Current users to ver 8.01 $99.95; ver 8.01 Pro $149.95”. We are writing to say what a great programme you have devised. It has been appealing, straightforward and simply a practical programme to use at Front desk. What an attractive well planned system. Our staff are enjoying the using it in our 12 bedroom hotel. Your tireless help and support has been an asset to us – since I am too busy to read the Manual. I will fully recommend your programme to anyone who is looking a well thought out programme like the Reservation Master. Hi Martien the system with siteminder is working great. You can see since the system went live in March 2013 the occupancy has almost doubled every month so far in 2013 vs 2012. I purchased reservation master 6 months ago roughly. Since then the software has done all that was promised. Martien’s email support when required (usually because I did not read the user manual) is super – thank you Martien. I can wholeheartily recommend this software. Don’t hesitate to email me if you have any questions . After some time we have got used to your system and must congratulate you on it. 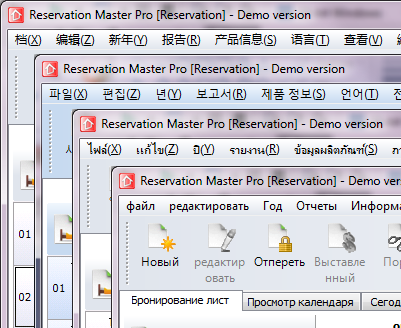 We can happily recommend Reservation Master to anybody in our industry, the reporting side is of exceptional standards. Your support is also first class. Just thought I would send a note to say what a great product this is. I run a small pub/hotel on the Island of Anglesey in North Wales and we downloaded the trial package. It was fantastic we didin't wait for the 30 day trial to expire we bought the pro version and have never looked back since. 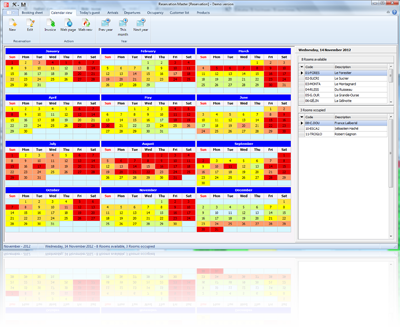 It is simple and easy to use and the reports it can generate are extremely useful. Thank you so much for making my life easier. I would have no hesitation to recommend your product to anyone. Simply brilliant!!!! I would just like to say what a wonderful programme Goldhill Software is to use. It is super user friendly (from entering a reservation, setting up a new product to modifying guest details etc), is jamb packed with features and extremely well supported by yourself. It would be one of the best ‘value for money’ software applications that I have ever purchased. Thank you Martien. I have been using Reservation Master for 2 years now and I am extremely happy with the product. It is exactly what I require to run my establishment in an efficient and effective manner. I recently had a minor problem where I appeared to lose all my data, however upon initial contact with you, I was guided and supported through the process to restore all my ‘lost’ data. The support and assistance you provided to me throughout the process was invaluable. You responded immediately with telephone and emails and made sure that I got back on track as soon as possible. The backup support you provide is of first class and at no extra expense which is extremely important to our small business. We congratulate you on both your product and the ongoing support you provide. With the knowledge that we have now, we highly recommend Reservation Master and believe it to be in a class of its own in relation to product, support, value and quality.